The varsity and JV teams raised $1,400 during their campaign, which concluded on the last game of the year and the team’s senior night. Each member of the team had supporters donate money and sign their pink fundraising T-shirts, which were worn as warm ups at the last game. A bake sale with goods made by team members also brought in funds during half time. This was the largest amount of money raised in the seven years Rocky Point basketball has participated. Junior captains of the varsity team, Clare Levy and Madison Gennaro, helped organize fundraising efforts and JV player, Kerry Campo, raised the most money of any team member. 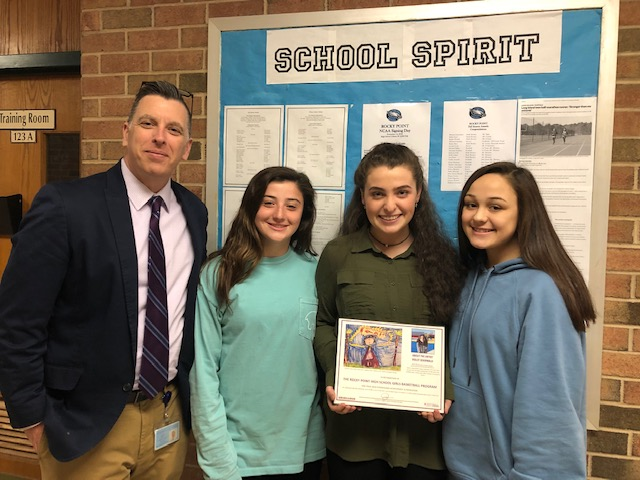 “Rocky Point girls basketball commitment to this important cause shows the kind of character and integrity that makes up the entire program and pulses through each and every student/athlete,” said coach Scott Lindsay. Photo caption: Rocky Point High School girls basketball coach Scott Lindsay, team members Clare Levy, Kerry Campo and Madison Gennaro.